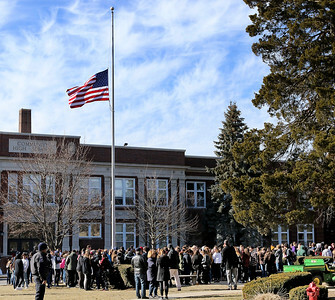 Matthew Apgar - mapgar@shawmedia.com Students walk out of class at 10:00 a.m. to gather around the flagpole at Crystal Lake Central High School on Wednesday, March 14, 2018 in Crystal Lake. The walkout coincides with a nationwide student effort to make their voices heard about the issue of gun violence in schools. 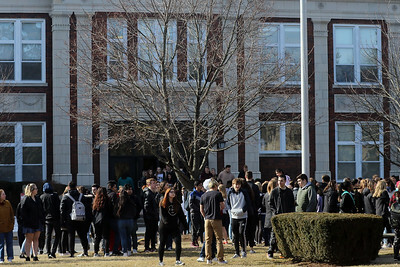 Matthew Apgar - mapgar@shawmedia.com School resource officer Chris Sanders walks by students gathered around the flagpole during a walkout at Crystal Lake Central High School on Wednesday, March 14, 2018 in Crystal Lake. The walkout coincides with a nationwide student effort to make their voices heard about the issue of gun violence in schools. 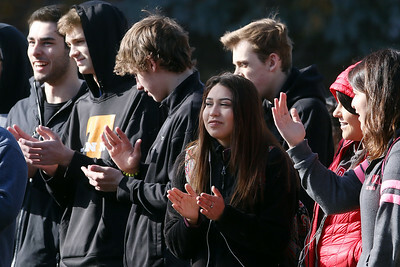 Matthew Apgar - mapgar@shawmedia.com Students react to a speaker during near the flagpole during a walkout at Crystal Lake Central High School on Wednesday, March 14, 2018 in Crystal Lake. The walkout coincides with a nationwide student effort to make their voices heard about the issue of gun violence in schools. 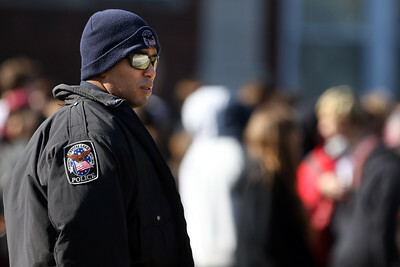 Matthew Apgar - mapgar@shawmedia.com School resource officer Chris Sanders watches over students gathered around the flagpole during a walkout at Crystal Lake Central High School on Wednesday, March 14, 2018 in Crystal Lake. The walkout coincides with a nationwide student effort to make their voices heard about the issue of gun violence in schools. 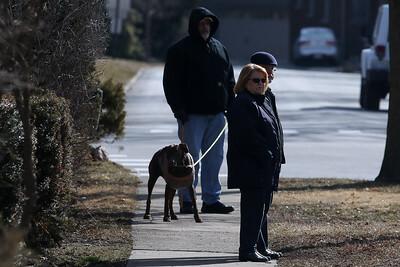 Matthew Apgar - mapgar@shawmedia.com A small crowd begins to gather across the street to watch students walk out of class at 10:00 a.m. at Crystal Lake Central High School on Wednesday, March 14, 2018 in Crystal Lake. The walkout coincides with a nationwide student effort to make their voices heard about the issue of gun violence in schools. 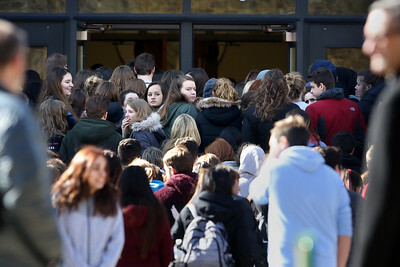 Matthew Apgar - mapgar@shawmedia.com Students head back to class at 10:17 a.m. after a walkout at Crystal Lake Central High School on Wednesday, March 14, 2018 in Crystal Lake. The walkout coincides with a nationwide student effort to make their voices heard about the issue of gun violence in schools. 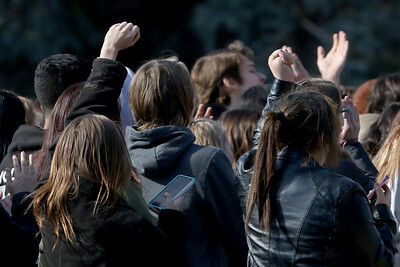 Matthew Apgar - mapgar@shawmedia.com Students briefly lower the flag during a walkout in front of Crystal Lake Central High School on Wednesday, March 14, 2018 in Crystal Lake. The walkout coincides with a nationwide student effort to make their voices heard about the issue of gun violence in schools. 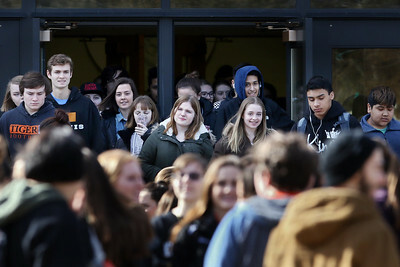 Students react to a speaker during near the flagpole during a walkout at Crystal Lake Central High School on Wednesday, March 14, 2018 in Crystal Lake. The walkout coincides with a nationwide student effort to make their voices heard about the issue of gun violence in schools.